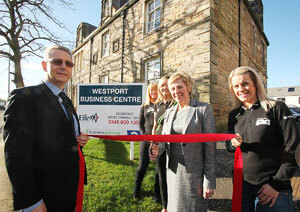 Westport Business Centre officially open! A CUPAR business centre is open for business and is already attracting success. Westport Business Centre in Cupar was officially opened this week by Fife Council Depute Leader and Planning and Business spokesperson Councillor Lesley Laird. The Centre has been created through the transformation of a listed building in Cupar and is made up of five offices for businesses as well as affordable housing and additional facilities for the community. It is part of a development which has been jointly funded by Fife Council Housing and Neighbourhood Services, Building Services and Kingdom Housing. • Business Gateway Fife; who provide Business Support throughout Fife. Councillor Lesley Laird said: “It was great to officially open the Centre and meet the businesses who are already getting the benefit of this fantastic facility.